Most people use their garage as a storage place for their vehicles, tools, and other things that don’t belong inside the house. However, only a few people use the full potential of the space instead of using it only as temporary storage. There are numerous ways and methods you can use in order to turn your garage into the ultimate DIY workshop; all you need is tools, goodwill, and a bit of patience. 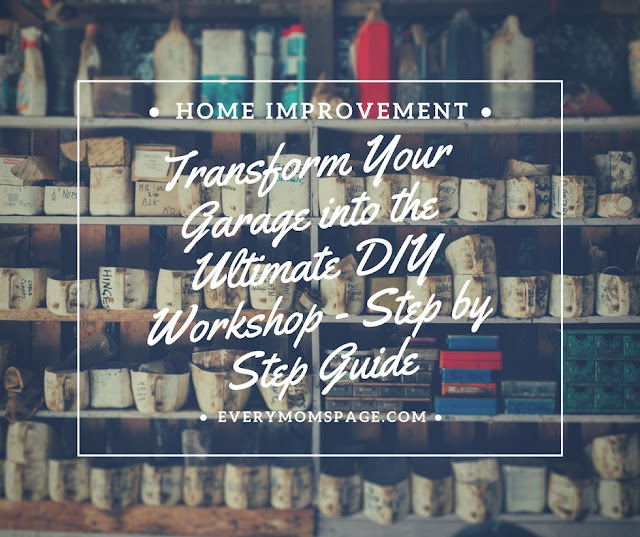 There are a lot of resources online where you can find ideas on how to turn your garage into more organized space. Reading this blog post from a garage door repair company helps a lot and will give you more ideas. Previous experience with carpentry is desirable but far from mandatory. As far as your budget goes for this project, you won’t need much money to turn the basic idea into reality. On the other hand, the more things you want to add and integrate, the more money you’ll spend. If you follow most of these steps closely, there shouldn’t be any issues along the way. In fact, the whole project should be done in a matter of few days as long as you devote enough time on a daily basis. The first thing you should do is get rid of all the unnecessary stuff inside the garage. You might not realize it, but a large percentage of things in your garage probably don’t belong there as they don’t have any specific purpose. For example, if you have a bunch of old newspapers lying around in the corner go ahead and recycle them. Not only do they take space, but they also don’t have a purpose besides taking up valuable free space. In the perfect world, one should get rid of everything that doesn’t facilitate making stuff. However, most of us don’t live in a perfect world and thus have to think about categorizing and separating household items from the workshop items. Therefore, you will probably have to make some compromises. In case you’re bound to categorize, make sure you do it neatly as it will bring confusion sooner or later if not handled correctly. In case you’re struggling with free space, you might want to consider building a DIY garage shelf using humble materials and simple techniques. Safety should be your primary concern. In order to make the space as safe as possible for work, make sure you clean the floor and get rid of the stuff lying around. The reason behind this is pretty simple – you don’t want to trip and fall over during work. There are two ways you can use to deal with this particular step – you can either buy or make your own workbench. In case you’re not willing to hassle with carpentry, heavy-duty tools, and a bit of stress – go ahead and purchase a workbench. However, it’s highly recommended that you make your own because that offers you much more room for customization. The most important thing to remember when building your own workbench is to include sturdy and reliable materials such as dense wood or even metal. The key to a good and reliable bench is its stability. Both the base and legs should be sturdy and heavy so that the table can’t be moved easily. The top part should be durable and resistant to dents, scratching, and etcetera. In case you’re struggling to come up with ideas, there are plenty of different DIY workbench plans you could refer to. The biggest investment in almost any workshop is the tools. Therefore, one should always make sure to keep their tools categorized and properly stored. Now, you can either invest in a high-quality toolbox and call it a day or you can DIY your way through by making some drawers or shelves. There are a lot of ideas you can find in this garage door blog. One way of doing this is by installing pegboards on your walls. Dealing with pegboards is probably one of the easiest ways you can solve the storage problem as it doesn’t require too much experience at all. In fact, one can easily make a DIY pegboard organizer within a day or two which is more or less a home project you can do in a weekend. One of the most important things you should remember is to keep your tools away from water, and humid spaces as that can lead to issues with rust and corrosion. On top of that, make sure to clean the drawers of dust occasionally as it can jeopardize the integrity of some tools. Last but not least, try finding cheap drawer mats online and install them into the drawers to keep the tools from sliding around. This particular step is usually done for the aesthetic appeal instead of functionality. However, that doesn’t mean it’s not important. Hiring a professional for this step isn’t necessary because you can give your garage a new and updated look by following a set of simple and easy rules. As far as the colors go, it’s entirely up to you to choose. It is recommended that you avoid bright tones as they usually tend to show imperfections on the walls and become dirty quite quickly. On the other hand, darker tones tend to hide dirty spots, stains, and etcetera. In case you are not eligible to mess with electricity, please hire a professional. It’s extremely dangerous to handle electricity if you’re not completely sure you know what you are doing, and it’s definitely among projects you shouldn’t DIY. The first thing you should think about is the position of the outlets. Most garages have one or two power outlets which are probably not nearly enough for a decent workshop to operate smoothly. That’s why it’s recommended that you install at least four or five outlets throughout the space. Most people compromise by using extension cords, but the solution isn’t as simple as it seems. Overusing an extension cord can lead to serious safety hazards, especially if you’re utilizing a cheap one. Low-quality extension cords aren’t able to cope with high currents which consequently leads to a fire. As you can assume, fire isn’t something you would want in your workshop, ever. Even though it doesn’t seem as important, lighting is a crucial part of every workshop. Lack of light can lead to serious safety issues, and you should never work under dark conditions without proper illumination. Track lighting is usually the safest way of dealing with dark garages because it’s relatively easy to setup, even if you’re not a professional. However, the biggest drawback of track lighting is the fact that it casts shadows, especially when mounted overhead. This issue can be solved by strategically positioning work lamps across the workshop so that they can eliminate the shadowing effect of overhead track lighting. In case you aren’t willing to hassle with work lamps and track lights, you can always opt for the LED solution. While it’s slightly more expensive in comparison to track lights, it’s far better in terms of carbon footprint, saving electricity, and most importantly – shadows. Now that you have dealt with the crucial elements, it’s time to add some additional accessories. Bluetooth speakers are a good solution for breaking the silence, but they are vulnerable to dust and debris. However, there are plenty of job site radios on the market that are specifically designed to withstand and endure tough environments. Mounting a TV on the wall or installing a computer in the corner is advisable but far from mandatory. The TV is slight overkill, but the computer is definitely a thing you should consider incorporating into your new workshop.